Respondesign, the company that makes Yourself! 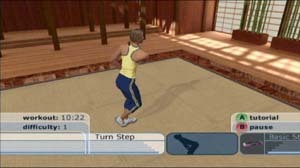 Fitness, has announced that they are releasing a Playstation 2 version of the game/workout program in February of 2005. It is currently available for Xbox and PC computers. Notice how the Workout Meter warns you that you’re going to be using the step right after the rest. Additionally, you can’t stop the preview workout to use a tutorial and learn the exercise or make it easier or harder. The free preview isn’t exactly as good as the real thing, but it gives you a good idea of what a workout with her is like.